Without a doubt the cactus paddle is one of the most representative ingredients of the Mexican cuisine. In fact there is a popular expression that says “more Mexican than the nopal". This saying is used due to the fact that the cactus paddle is considered an icon of the Mexican identity , to such a degree that it appears stamped on the National Emblem. So when the cactus paddle is used to prepare a salad, one knows that such salad is going to be 100% Mexican. This salad, apart from being Mexican, is very fresh and nutritious – it is also full of colors and flavors because it is prepared with many ingredients. This salad doesn’t serve only as an entree plate it can also be a very good garnish of main courses, like of a tasty grilled steak or an arrachera. *There are people that don’t like the cactus paddle salad because it is very sticky and we agree with them it is an unpleasant sensation. But don’t worry because here you will learn to prepare the cactus paddles without the sticky substance. In this recipe there are many steps to follow and it is a bit laborious but everything is easy to perform. The recipe is given with spineless and peeled cactus paddles. Buy them in this way so you won’t get stung. In this recipe the cactus paddles are cooked and the Mexican tradition of cooking them in a copper saucepan can be followed, in this way they won’t lose their color. This salad is not spicy however if you want it spicy, add 1 minced serrano pepper. Approximately in 30 minutes the salad will be ready. Cut into small strips 8 spineless and peeled cactus paddles. The small strips of the Cactus Paddles that were cut. The enough Water to cover the cactus paddles. When it boils reduce to medium-high heat, cover the saucepan and leave the cactus paddles cooking in the boiling water for about 12 minutes, until they soften and they turn to a lighter color. Transfer from the saucepan to a colander the small cactus paddle strips that were cooked and rinse them with cold water. This stage is optional. Perform it if you want to cut all the sticky substance of the cactus paddles. Transfer from the colander to a frying pan the small cactus paddle strips that were rinsed. Roast over medium heat the small cactus paddle strips for about 3 minutes, until the liquid that the cactus paddles release has completely consumed; stir regularly. Transfer from the frying pan to a bowl the small cactus paddles strips that were roasted, then reserve. Dice 2 avocados and 2 tomatoes; then pass them to the bowl with the cactus paddles and reserve. Finely chop 1/2 onion and 2 coriander sprigs; upon completion put them in the bowl. Also add in the bowl 1/2 cup of crumbled fresh cheese and reserve. Pour the dressing that was beaten in the bowl over the other bowl, where the cactus paddle salad is. Mix very well the cactus paddle salad with a mixing spatula. If you want to garnish the salad you can put over it some tomato slices, some avocado strips and onion in half moons. Suggestion: Make tacos with this salad – you will love them. Just heat some corn tortillas put some cactus paddle salad, roll the tortillas and your tacos are ready . Variation: Put the cactus paddle salad on tostadas and in this way you will have an exquisite and simple antojito. 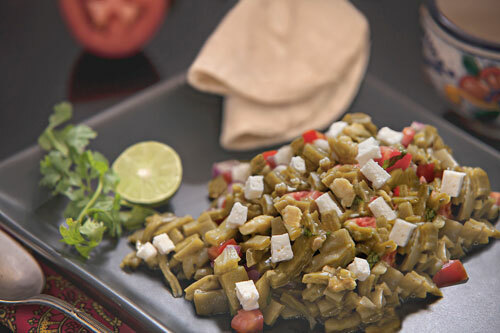 Did you like the Nopal Cactus Salad? ࿃ To continue your meal prepare a Soup. ࿃ Then prepare a Vegetarian Main Course. ࿃ And to close a Dessert. ࿃ Don’t forget a refreshing Mexican Drink. Your nopal salad will look beautiful in a glass food container like this one. If you don’t find the nopal paddles you can also use these ones. Unfortunately the flavor is not as good as the fresh nopales but they will do a good job in your salad. Use this copper pot and get amazed with the flavor that the nopales will acquire.